Iona is known in Gaelic as Ì Chaluim Chille, meaning Iona of Saint Columba, or as Eilean Idhe, and further back yet it had a Norse name, Eyin Helga. Iona is just off the south-western tip of Mull, which itself is just across the Firth of Lorn from the northwest coast of Scotland. 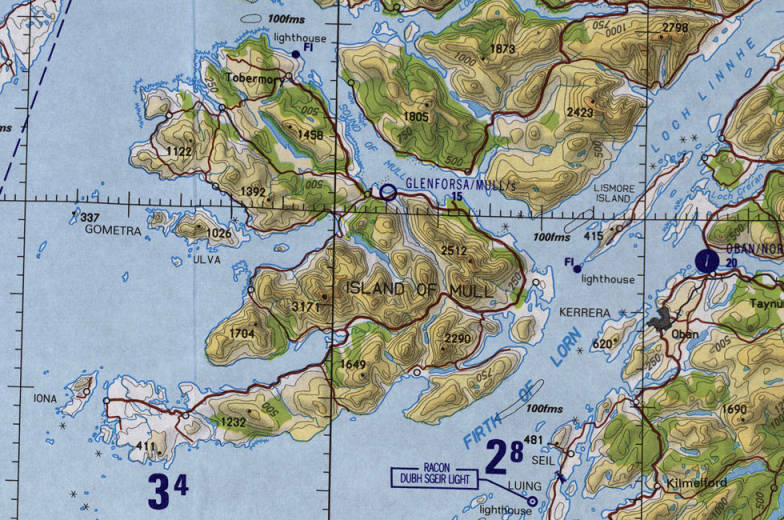 My plan was to look around Oban, and then take a ferry from Oban to the northeast coast of Mull, just beyond the lighthouse shown on the above chart. That connects to a bus across Mull to its southwest tip. Then a short ferry crosses the narrow sound to Iona. In addition to Vikings and early Celtic Christianity, Iona is also the burial place of 48 Scottish kings, including Macbeth (1005-1057). Yes, he was real, Shakespeare didn't make him up. However, Shakespeare's story is largely made up. 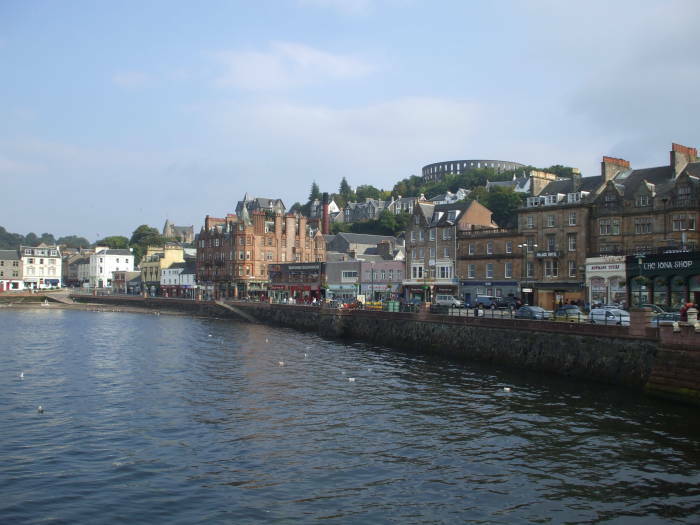 Oban is on the coast, about ninety minutes by bus southwest of Fort William and connected to Glasgow by frequent bus and three or so trains to and from Glasgow Queen Street station every day. Oban, or An t-Òban in Gaelic, meaning The Little Bay, is called "The Gateway to the Isles" as it's the major ferry port for connection to the Inner and Outer Hebrides. The Oban distillery, below the Stuart McCaig Tower. A prominent sight is the Stuart McCaig Tower looming over the center of town. It was built in 1897-1902 at the direction of a philanthropic banker, with the dual purposes of providing work winter work for the local stonemasons and building an epic monument to him and his family. His design (being his own architect, a key aspect of most any architectural folly) was for an elaborate structure based on the Colosseum in Rome, with the addition of a tall central tower containing statues of himself and his family, plus a museum and art gallery within the main circular walls. Just the outer walls were finished before he died. The purpose of the trust is that my heritable estate be not sold, but let to tenants, and the clear revenue or income be used for the purpose of erecting monuments and statues for myself, brothers and sisters on the tower or circular buildings called the Stuart McCaig Tower, situated on the Battery Hill, above Oban, the making of these statues to be given to Scotch sculptors from time to time as the necessary funds may accumulate for that purpose; also that artistic towers be built on the hillock at the end of Airds Park, in the parish of Muckairn; and on other prominent points on the Muckairn estate, and on other prominent places on the various estates; such in particular on the Meolroor of Balagown, lying north-east of Kilachonish Farmhouse. My wish and desire is to encourage young and rising artists, and for that purpose prizes be given for the best plans of the proposed statues, towers, &c., before building them. Further, in order to avoid the possibility of vagueness of any kind, I have to describe and explain that I particularly want the trustees to erect on the top of the wall of the tower I have built in Oban, statues in large figures of all my five brothers and of myself, namely, Duncan, John, Dugald, Donald, Peter, and of my father, Malcolm, and of my mother, Margret, and of my sisters, Jean, Catherine, Margret, and Ann; and that these statues be modelled after photographs. And where these may not be available, that the statues may have a family likeness to my own photograph or to any other member of my foresaid family; and that these statues will not cost less than one thousand pounds sterling, and that money to come out of the accumulated clear revenue. More interesting, at least to me, was the Oban Distillery, at the base of Battery Hill and just off the northwest corner of the harbor. You pay to take the tour, not much, significantly less than the cost of going to a pub and ordering the equivalent of the end-of-tour tastings. A simple example phenol molecule, a hydroxyl group bonded to a phenyl ring. Better yet, join the Friends of the Classic Malts program or similar for free admission to tours. I found the tour very interesting, the initial stages are similar to processes used in home brewing. Note that Scotch is spelled whisky while the Irish and American products are spelled with an added "e", whiskey. Also note that Scotch is the beverage, while Scottish is an adjective for things from Scotland and Scots are people from Scotland. Things have changed since the old days. Almost all of the distilleries buy their barley already malted, and the smokiness comes from added phenols, not directly from peat smoke. Oban single-malt in its final form only contains about 5 ppm peat smoke phenols. Talisker, from the Isle of Skye, is about 25 ppm. Islay whiskies tend to be above 25 ppm. Oban uses a 10 hour mash cycle, with 58°C and 68°C sparges. There's a third sparge, even hotter, but it's just to make the sparge liquid to be used for the next cycle. The number and temperatures of the sparge cycles will vary from one distillery to the next. 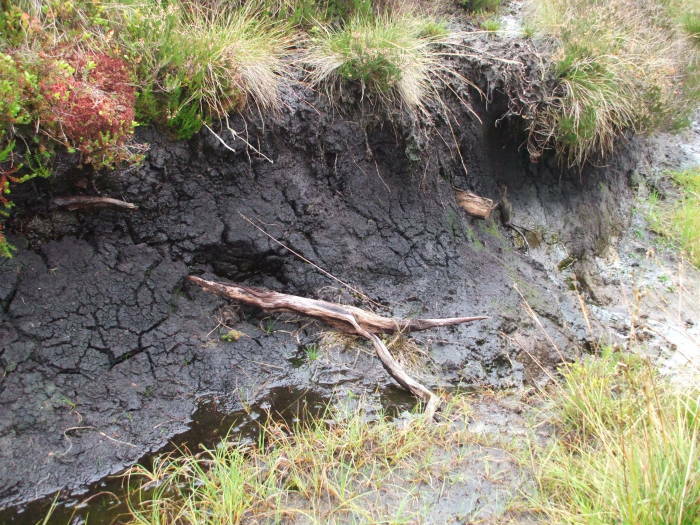 Peat forming along the Road to the Isles trek from Corrour Station to Glen Nevis. Oban ferments the resulting wort for four days. That sounded fast to me, but they said that some distilleries finish their fermentation in as little as 2.5 days. The result, similar to partially finished ale, is distilled twice to 64% a.b.v. The result is completely clear. It is placed in barrels for aging, by law all Scotch whisky must be aged for at least three years in oak casks. There are laws in the United States requiring bourbon and Tennessee whiskey to be aged in new oak casks. Why? The laws were passed because of lobbying by the barrel making industry, to create more work. It's one of the forms of weak socialism in the U.S., like the farm subsidies in which farmers are paid to not grow crops. Anyway, the barrels are used once in the U.S. and then broken down and shipped to Scotland. Some sherry casks are also shipped in from Spain. Different distilleries use different types of barrels at different generations after their original use. That is, an American barrel might be shipped to distillery #1 and used two times, then shipped to distillery #2 and used three more times. A short report in the journal Science [vol 329, 27 Aug 2010, pg 999] reports that industrial microbiologist Martin Tangney, of Edinburgh Napier University, has patented a process to turn whisky distilling byproducts into an automobile fuel based on butanol, C4H9OH. Draff is the residue of the fermentation stage. There are hundreds of distilleries in Scotland, and they produce 187 million kilograms of draff each year. 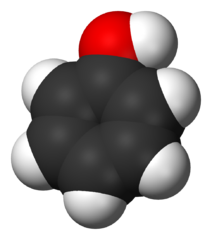 Clostridium acetobutylicum bacteria convert the draff to butanol. Additional water is needed, available in the form of pot ale, what's left behind in the distillation stage. 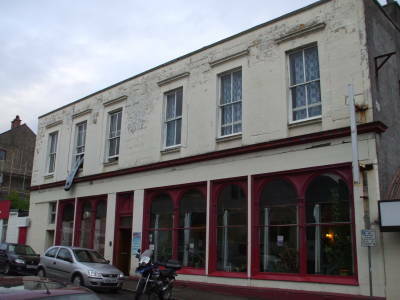 You'll need to stay somewhere — I stayed at Oban Backpackers, just a few blocks north of the harbor. The Oban War and Peace Museum does a very nice job of explaining Oban's military and geopolitical connections during and since World War II. During World War II Oban was a major port for the Royal Navy and for the North Atlantic convoys between the UK and North America. There was also a major RAF flying boat base on Kerrera, the small island directly across from Oban harbor. 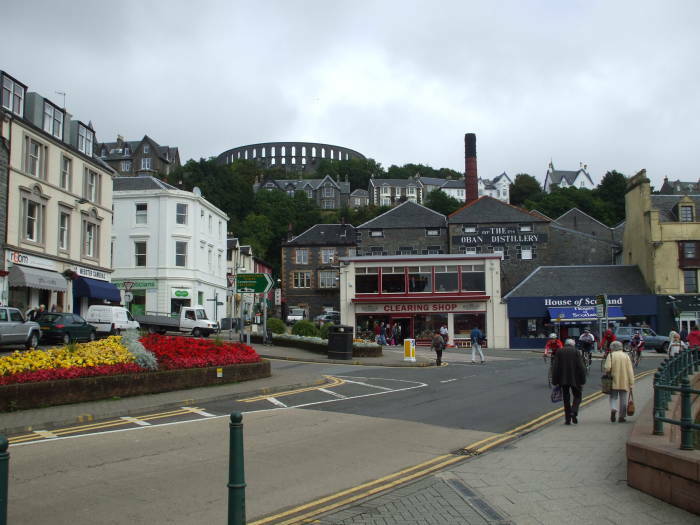 During the Cold War Oban was significant as the landing point for TAT-1, the first Trans-Atlantic Telephone cable. TAT-1 came ashore at nearby Gallanach Bay, and it also carried the "Hot Line" between Washington and Moscow.